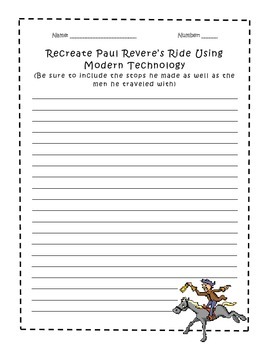 This is an activity I have my students do after we study Paul Revere's midnight ride. We discuss where he stopped and who went along with him as well as who was captured. I then have them do a short narrative writing assignment to re-create his ride using modern technology. I have gotten some cute responses such as: "He hopped in his Mustang convertible and stomped the gas. Then he grabbed his bullhorn and started shouting, "The British are Coming!"